Author: Thilo C. Schadeberg. Series edited by: Wilhelm J.G. Möhlig, Bernd Heine. 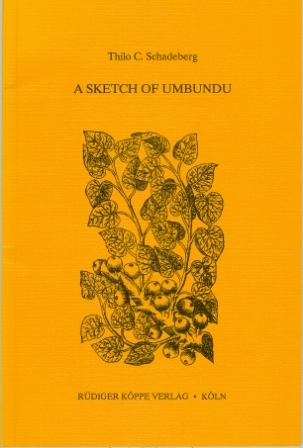 This work consists of a grammatical outline of the Bantu language Umbundu. This language has been coded R.11 in Guthrie’s referential classification, and it is spoken as lingua franca by 6 million people in the Southwest of Angola and along the Benguela railway to the Central parts of the country. Umbundu should not be confounded with Kimbundu (H.21) which is also spoken in Angola (by about 4 Mill. people) but which differs very much from the former. Phonology, Noun Classes, Augment and Tone, Adjectives - Numerals - Determiners, Substitutives - Demonstratives - Connexives, Derivation, Verb Forms: Constituent Elements, Affirmative Verb Formes, Negative Verb Formes, Relative Verb Forms, Irregular Verbs - Compound Verb Forms, Nominal Predication - Index Forms - Forms Without Agreement, Text: The Story about Hare and Lion.